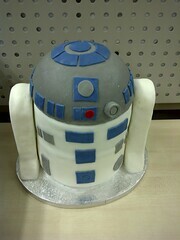 It was my Birthday on Monday and had no idea what cake I wanted. 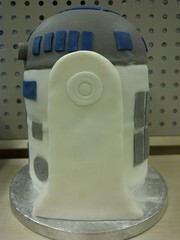 After watching an episode of "Ace of Cakes" making a R2D2 cake I knew straight away that's what I wanted. 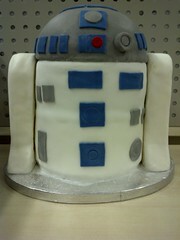 I don't have the skills to make a full size, working R2D2 cake like Duff and his team but it didn't stop me having a go! 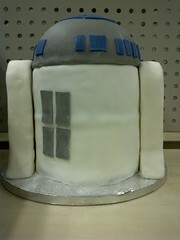 I went to my local cake suppliers and got some polystyrene cake dummies. I used a 6" round one for the bottom - I could have used cake but only had one 6" tin and didn't have time to bake a second cake. I also bought a 6" square one so I could cut it and make the legs. I used a CAD program to draw out a rough shape for the legs. For the dome I used the Wilton Sports Ball Pan, which is 6" round too. I made a basic vanilla sponge and put some butter icing inside the dome. 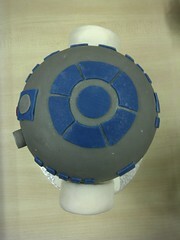 Covered in white fondant and decorated using coloured fondant and used my cutters.